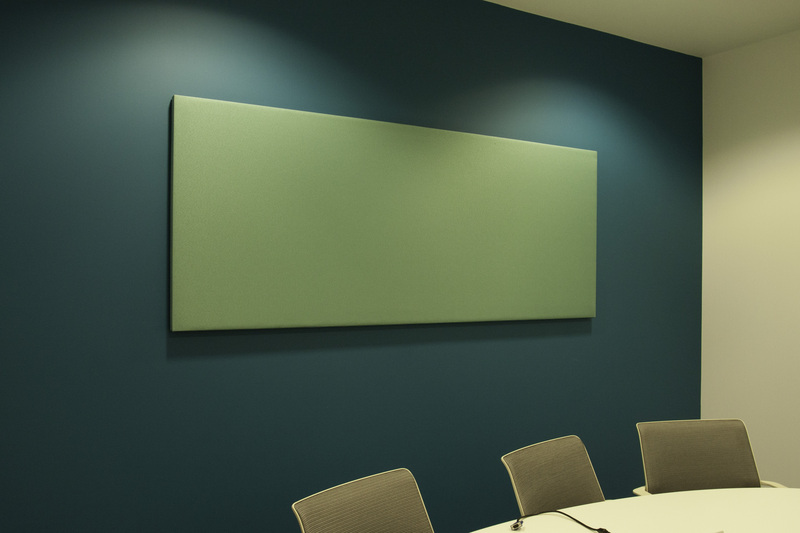 The launch of our new range of Polymer Acoustic Wall Panels comes after extensive research and development to manufacture a cost effective but highly efficient noise reducing product. The polymer acoustic panels make use of recycled polyester to create “green” lightweight and best priced panels up to 2.4 by 1.2m in size. The resultant maximum area of coverage (2.88sqm) provides a large surface to help absorb sound energy and dissipate it via friction with the internal polymer lattice. This coupled with a choice of thickness from 25 to 50mm gives a noise reduction coefficient greater than many of the much higher priced alternatives. The polymer lightness allows the panels to be fixed simply to the wall via magnets, gluing or screw fixing to give a fast and well-priced installation. This is a rapid way to introduce measures to reduce noise problems within an office environment and converts highly reverberant walls into an effective noise absorber. The new design also allows the polymer to be fabric wrapped in a large choice of block colours to introduce feature definition to your office areas and develop different themed styles. We can even overprint images onto the surface of the panels to allow the introduction of a more colourful and artistic finish.